By seeking to override or ignore the will of Israeli democracy, they are accelerating the breakdown of the rapidly eroding bipartisan consensus in favor of the Jewish state. That’s pretty much the reaction of much of the Democratic Party to the results of Israel’s election. Prominent Democrats have greeted the victory of the man who was the bitter foe of President Barack Obama and, just as bad, the close friend and ally of President Donald Trump with a mixture of dismay and horror. More to the point, they view the judgment of Israel’s voters – the majority of whom voted for either Prime Minister Benjamin Netanyahu’s Likud party or other slates that were pledged to support his bid to lead the next government – as not merely wrong, but contrary to what is good for their country. We’re all entitled to our opinions about the outcomes of elections. But this revulsion on the part of Democrats for the democratically expressed will of the Israeli people is likely to widen the divisions in their party about attitudes regarding the Jewish state. Even more troubling is that it increases the likelihood that support for Israel will be an issue in the 2020 presidential election. That will accelerate the crackup of what is already a rapidly eroding bipartisan coalition in favor of Israel. The key talking point for pro-Israel Democrats for the last 25 years has been the claim that Republicans are undermining the bipartisan pro-Israel consensus by seeking to portray themselves as better friends to the Jewish state than their opponents. This is a somewhat dubious argument because the main purpose of such claims was to distract voters from the fact that the left wing of the Democratic Party was drifting towards being either highly critical or downright hostile to Israel. But with Netanyahu being re-elected for a fourth consecutive term, more and more Democrats are dropping the pretense that we all still agree about Israel, and instead are adopting stances that condemn the prime minister as someone who is unworthy of support, or even more, assert that they know better about what is good for Israel than the Israelis. There isn’t anything new about this since it was, in essence, the way the Obama administration regarded Israel throughout its eight years in office. Obama believed not only that more “daylight” between the two allies was better for Israel than steadfast support, but also that the Jewish state needed to be “saved from itself” with respect to the conflict with the Palestinians. He was just as indifferent to Israel’s credible fears about efforts to appease Iran via a one-sided nuclear deal. Yet when faced with Obama’s changes of U.S. foreign policy that were clearly aimed at undermining the alliance with Israel, most Democrats chose not to protest. The arguments about what it means to be pro-Israel have only grown more divisive since Trump took office. Acknowledging the truth that Trump is the most pro-Israel president to date is a difficult pill for Democrats, who despise the president, to swallow. So rather than concentrate their fire on other issues, many simply argue that supporting Israel and respecting the will of its voters represent betrayals of the alliance. This takes the form of bogus claims that Netanyahu’s election is a sign of a decline of Israeli democracy, rather than an expression of it. That this is absurd and illogical doesn’t deter them. Some of their points are also deeply hypocritical. Suffice it to say that no matter what you think of Netanyahu’s electoral maneuver that enabled supporters of the late Rabbi Meir Kahane to join another electoral list (though in the end, those Kahanists were not elected to the Knesset), Democrats who don’t mind rationalizing the behavior or benefiting from the votes of anti-Semitic, BDS-supporting colleagues like Reps. Ilhan Omar (D-Minnesota) and Rashida Tlaib (D-Michigan) have no standing to criticize him on this issue. More importantly, their position is rooted in the even more outrageous notion that Democrats understand the conflict with the Palestinians better than the Israeli people. It’s important to remind those who make this argument that the Israeli political parties that clung to the illusion that Obama was right about the Palestinians and the two-state solution – namely, Labor and Meretz – got approximately 8.25% of the vote on April 9. They have been discredited by the reality of Palestinian intransigence that has somehow evaded the notion of Israel’s Democratic critics. In 2020, the odds are that whoever it is the Democrats nominate will be someone inclined to bash Netanyahu and to treat the judgment of Israel’s voters about their security with disdain. This means that Israel will become a campaign issue for Trump, who will highlight his support for the Jewish nation, a position that is still backed by a clear majority of Americans. Once this issue becomes fodder for campaign rhetoric from both sides, it will be a mortal blow to the pro-Israel consensus. And if the Democrats win, it will mean U.S.-Israel relations in the years that follow will make the spats between Obama and Netanyahu look like a picnic. Democrats will try to blame this on Trump, but as with Obama’s stance on the Palestinians and Iran, such arguments will be utterly disingenuous. If Democrats want to preserve the pro-Israel consensus, then they need to be supportive of Israel, understanding of its exterior and interior security dilemmas, and respectful of the democratically expressed will of its people. More to the point, they cannot make common cause with those who seek – as some on the left wing of the Democrats do – to delegitimize or oppose the existence of Israel. If Democrats can’t manage to respect Israel’s voters or refrain from seeking to override their judgment, they shouldn’t complain about the demise of a consensus that they themselves have chosen to abandon. The Russians and the Syrian regime, albeit more discreetly, have reservations about Iran’s presence in the country. The sense in Israel, therefore, is that a window of opportunity now exists for pushing Iran out of Syria or at least significantly minimizing its activities there. The attack attributed to Israel’s air force early Saturday indicates that Israeli policy in Syria hasn’t changed now that the elections are over: No to Iranian entrenchment, and no to precision missiles in the hands of Hezbollah. The target, according to Syrian media outlets, was located in the city of Masyaf, in Hama province. The Israeli air force, the reports said, has attacked various facilities, used by Iranian forces, in the same area at least five times over the past two years. This time, it appears, the main target was the site where the Iranians have manufactured precision missiles for Hezbollah. We can assume the missiles were earmarked for transfer to Lebanon although Iran also intends to arm its other Shiite militias operating in Syria with similar missiles. Hezbollah’s precision missile project, which Iran is carrying out, lies at the heart of Israeli activity in recent years. Iran wants Hezbollah to have precision capabilities – Prime Minister Benjamin Netanyahu, last year, mentioned a precision radius of approximately 10 yards – and simultaneously extend the range of some of the terrorist group’s missiles. Israel has already been blamed for several attacks on facilities where this activity is occurring, including the attack last September in western Syria that triggered the chain of events which led to the downing of a Russian spy plane by Syrian army air defenses. The attack early Saturday morning went smoothly from an Israeli perspective – neither Syria nor Russia responded in a significant manner. We can glean from this that Russia has come to terms, for now, with this activity, as long as it doesn’t endanger Russian forces stationed in Syria. The Israeli air force is likely taking pains to avoid, as much as possible, any friction with Syrian surface-to-air batteries, in order to circumvent further scenarios that could spark another diplomatic clash with Russia. Israel’s policy of being proactive against Iran and its proxies is also unlikely to change for the time being. Regardless, the new government – and the next defense minister – will have to re-examine this activity within the context of new developments in Syria as it concludes its eight-year civil war; along with possible Iranian military intervention in Iraq and efforts to relocate its precision missile factories to Lebanon. In the past year, Israel has exposed four such factories – three of these, which were built secretly in Beirut, were revealed by Netanyahu in his speech to the U.N. General Assembly. The fourth factory, according to various news outlets, was reported in March to the Americans, who addressed the matter with the Lebanese government. The sense in Israel is that a window of opportunity now exists for pushing Iran out of Syria or at least significantly minimizing its activities there. This window, beyond Russian reservations over Iranian activity (not to mention the Syrian regime’s own reservations, although these aren’t voiced publicly), is open because of American support and last week’s designation of Iran’s Revolutionary Guards as a terrorist organization by the Trump administration. The hope in Israel is that a combination of military, diplomatic, economic and media-related activity can now thwart Iran’s machinations. Several buildings destroyed in alleged attack near town of Masyaf, Syria’s state news agency reports. Rights group says 17 wounded, several dead. Iranian delegation was reportedly touring military sites in the area at the time of the strike. An Israeli airstrike on a military position in central Syria early Saturday wounded six soldiers and destroyed several buildings, Syria’s state news agency SANA reported. SANA quoted an unnamed military official as saying the airstrike near the town of Masyaf, in Hama province, hit a military academy widely known as the Accounting School. It said Israeli warplanes fired missiles toward Syria from Lebanon’s airspace and that Syrian air defenses shot down some of the missiles. The IDF declined to comment. Israel does not usually comment on reports concerning its airstrikes in neighboring Syria, though it has recently acknowledged striking Iranian targets there. The last such strikes that Israel announced were in late March. The most serious wave of airstrikes on Syria this year occurred in January, when the IDF hit several Iranian targets, saying it was responding to an Iranian missile attack a day earlier. The Iranian launch followed a rare Israeli daylight air raid near the Damascus International Airport. In upcoming article, former National Security Council head Jacob Nagel discusses nonclassified parts of Prime Minister Benjamin Netanyahu’s security and defense outlook • Netanyahu does not see any existential threat to Israel right now, and wants to keep it that way. Nine months after Prime Minister Benjamin Netanyahu finished a written outlook of his views on Israel’s security and defense, which he presented in several different forums, Israel Hayom has obtained a number of unpublished sections of the document. In a professional article due to be published in the U.S., former acting National Security Adviser Jacob Nagel reveals additional nonclassified parts of Netanyahu’s security and defense outlook. One of Netanyahu’s underlying assumptions is that there is currently no existential threat facing the state of Israel, Iranian threats notwithstanding. Nagel writes that Netanyahu thinks this situation should be maintained. A third major aspect of Netanyahu’s outlook is that Israel must transition to a state of ongoing warfare rather than preparing for wars characterized by outbursts of extreme violence, such as those Israel fought in the early years of its existence. The defense establishment considers a well-organized and written security and defense doctrine to be a tool of utmost importance when it comes to force building. Nagel states in his article that it is rare for a prime minister to compose his own security and defense outlook. The last complete defense outlook for Israel was compiled by David Ben-Gurion and approved by the government in 1953. Since then, no other doctrine has been approved, although attempts have been made over the years to update the Ben-Gurion document. The Israel Defense Forces on Sunday said it was standing down the extra forces deployed to the Gaza border region during an uptick in violence last month. “The IDF continues to be highly prepared to act quickly according to need and situation assessment,” the military said in a statement. During the flareup the military had deployed two additional brigades to the Gaza Division, along with an artillery battalion, fleets of drones, and field intelligence units. Reservists were also called up from air defense, intelligence and other select units. The troops were sent to the south ahead of protests on March 30 to mark Land Day and the anniversary of the “March of Return” protests, and after a rocket fired from the enclave destroyed a residential building in central Israel, injuring seven people. Amid peak tensions, senior commanders had been preparing for a variety of scenarios, including the possibility of a deterioration of violence to the point of a large-scale ground operation. 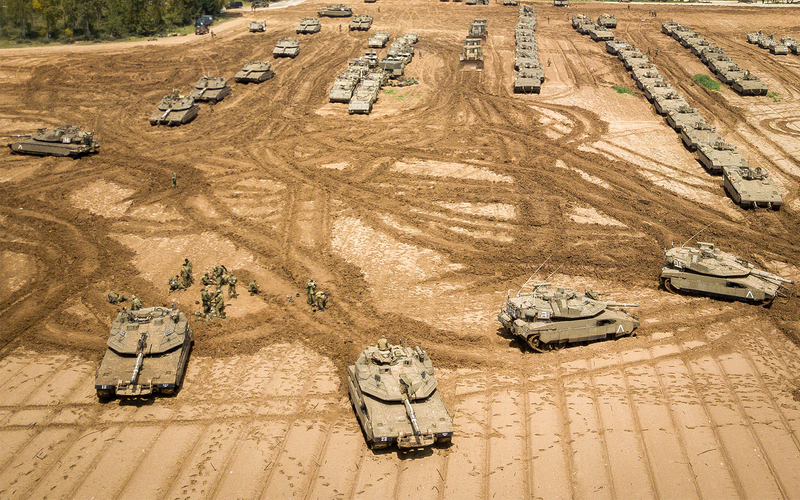 The brigades were brought to the Gaza border region from planned training exercises. On Sunday, they were given orders to return to their usual schedules. The decision came amid a significant decrease in the level of violence along the border. The number of balloon-borne explosive and incendiary devices flown over the border has dropped in recent weeks, though attacks have not stopped entirely. Nightly riots have ended, and the weekly protests on the border have been held farther from the security fence. Last year on Land Day — March 30 — Palestinians in the Gaza Strip launched the “Great March of Return,” a series of weekly protests and riots along the security fence. Israel maintains that Hamas appropriated the campaign for nefarious purposes, using the civilian protesters as cover for violent military activities. Land Day marks a 1976 decision by the Israeli government to seize thousands of dunams of Arab-owned land in the Galilee region of northern Israel. A senior leader of Hamas, the terror group that rules the Gaza Strip and is sworn to Israel’s destruction, on Wednesday dismissed the outcome of Israel’s election as irrelevant, as near-final results, later confirmed, showed that Prime Minister Benjamin Netanyahu’s right-wing bloc had won a clear majority in the Knesset vote. On Friday, Palestinians said a 15-year-old was shot and killed during weekly protests along the Gaza Strip border as rioters threw rocks and fire bombs at IDF troops, who responded with tear gas and live fire. Some 7,400 Palestinians gathered for the demonstrations at several sites along the border.